The Alpine family includes vanity lights, table lamps, chandeliers, billiard fixtures and more. Meyda Custom Lighting this week announced the debut of its Alpine family of customizable decorative lighting. Shown above are two ceiling pendants. On the left is the 22-inch W Alpine Inverted Pendant (150053) which projects beautiful ambient lighting diffused through a lens crafted of Sky Blue opalescent art glass with a Snowy White iridescent glass diffuser on the bottom of the fixture. 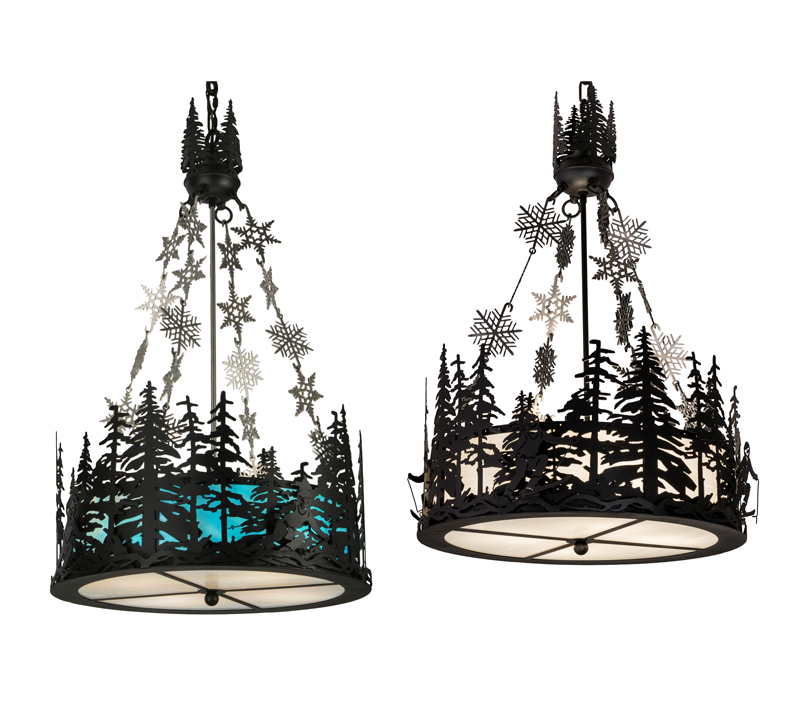 A stand of tall pines is featured in a Black Textured finish while snowflake accents are finished in Nickel. On the right is the 22-inch W Alpine Inverted Pendant (15434) which features White art glass enhanced by decorative accents and hardware featured in a Black and Steel finish. All lens materials, finishes and artwork profiles are customizable to the mountain backdrop of a home, lodge or resort. Lens colors and metal finishes can be chosen from a vast palette of options. These pendants are handcrafted by highly skilled artisans in the Meyda Custom Lighting manufacturing facility, located at the foothills of the Adirondack Mountains, not far from Lake Placid, home of the 1932 and 1980 Winter Olympics. The Alpine family includes vanity lights, table lamps, chandeliers, billiard fixtures and more. Custom sizes, diffuser colors, finishes and dimmable lamping options are available. UL and cUL listed for damp and dry locations.